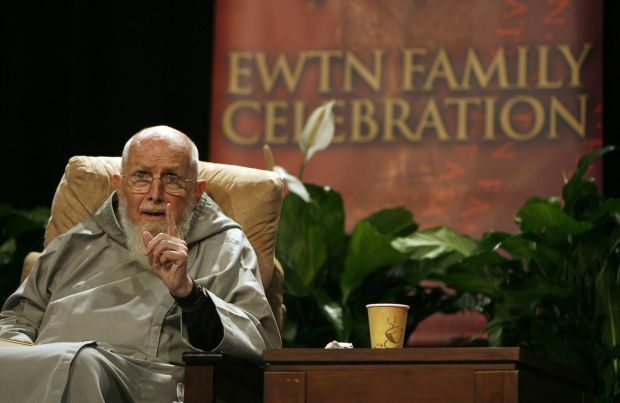 TOTOWA, N.J. (CNS) — Father Benedict J. Groeschel, who was a founder of the Franciscan Friars of the Renewal, a leading pro-life figure and popular author, retreat master and preacher, died Oct. 3 at St. Joseph’s Home for the elderly in Totowa after a long illness. He was 81. “We are deeply saddened by the death of Father Benedict. He was an example to us all,” said Father John Paul Ouellette, who is also a Franciscan friar and the order’s community servant. “His fidelity and service to the church and commitment to our Franciscan way of life will have a tremendous impact for generations to come,” he said in a statement released Oct. 4 by the order’s community office in the Bronx, New York. A wake was planned for Oct. 8 at St. Adalbert’s Church in the Bronx, with a wake to be held Oct. 9, followed by an evening vigil, at the Cathedral Basilica of the Sacred Heart in Newark, N.J.
A funeral Mass will be celebrated for Father Groeschel Oct. 10 at Newark’s cathedral basilica, followed by burial at Most Blessed Sacrament Friary in Newark. The burial will be private. “The Catholic Church and the Franciscan family lost a giant today,” said an Oct. 3 statement issued by Father Groeschel’s community. “Father Benedict was a brother and a father to everyone he encountered. In a world often overwhelmed with darkness, he was a man filled with hope, a hope that he shared with both the rich and poor alike,” the statement said. “His love for others and deep desire to serve sent him among poor families who were in need of assistance, young people trying to find their way, bishops faced with challenging decisions, priests and religious in need of an encouraging word, and the stranger who was far from God. Over the past decade, despite his decline in health, Father Groeschel “continued to serve the church generously and with great fidelity,” according to his community. In January 2004, Father Groeschel hovered near death after a car hit him in Orlando, Fla. After a yearlong recovery, he had to walk with a cane and experienced weakness in one of his arms. But he was able to resume his schedule. In 2012, following a minor stroke and other health complications, he officially retired from public life and was welcomed by the Little Sisters of the Poor in Totowa. Daily visits of family and friends were the highlight of his days along with spending time in the chapel, concelebrating Mass and making his daily Holy Hour. Father Groeschel had published a number of books on spirituality and pastoral counseling and founded the Trinity Retreat, a center for prayer and study for clergy. He taught at Fordham University, Iona College and Maryknoll Seminary. At the time of his death, he was writing a memoir to be published by Our Sunday Visitor called “The Life of a Struggling Soul.” He also wrote numerous articles for various periodicals including First Things and Priest Magazine. In the 1970s he headed the Office of Spiritual Development in the Archdiocese of New York. For more than 30 years he was a regular on various programs on the Eternal Word Television Network. He was host of EWTN’s “Sunday Night Prime” program for many years. His outreach to the poor was legendary — for decades he distributed food to hundreds of needy people in the South Bronx. His first assignment as a priest was as Catholic chaplain at Children’s Village in Dobbs Ferry, N.Y., a residential facility for troubled children. After being there 14 years, he became founding director of Trinity Retreat in Larchmont, N.Y., a retreat house primarily for Catholic clergy and religious. He served there for 40 years. He also was the founder of St. Francis House in Brooklyn, N.Y., for older adolescents. In 1985, he and Chris Bell founded Good Counsel Homes for young pregnant women in need. Born Robert Peter Groeschel July 23, 1933, in Jersey City, N.J., he was the eldest of six children. He graduated from high school in 1951 and 10 days later entered the novitiate of the Capuchin Franciscan Friars of the Province of St. Joseph in Huntington, Ind. The following year he professed temporary vows and took the name Benedict Joseph, after the Franciscan saint, St. Benedict Joseph Labre. He professed his final vows in 1954 and was ordained a priest in 1959. He received a master’s degree in counseling from Iona College in 1964 and a doctorate in education, with a specialty in psychology, from Teachers College at Columbia University in 1971. During his early years as a priest he was invited to conduct a retreat for the Missionaries of Charity in India, which was the beginning of Father Groeschel’s long relationship with that community and his deep friendship with its founder, Blessed Teresa of Kolkata. 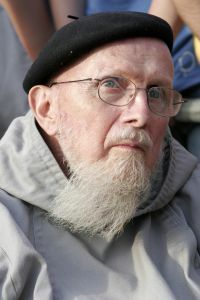 In 1987, Father Groeschel and seven other friars left the Capuchins to form a new religious community, the Franciscan Friars of the Renewal, based in the South Bronx and dedicated to the service to the poor. The community now numbers 115 members. A similar community for women, the Franciscan Sisters of the Renewal also was formed; it currently has 35 members. Father Groeschel is survived by two sisters, Marjule Drury of Caldwell, N.J., and Robin Groeschel of Glendive, Mont., and one brother, Garry Groeschel of St. Petersburg, Fla., and nine nieces and nephews. He was preceded in death by his brothers Ned and Mark. Fr.Groeschel was instrumental in my conversion to the faith. He will be missed but his legacy will live on. We now have another Saint to pray for us.